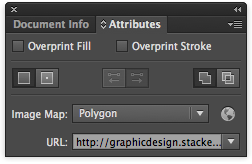 Is it possible to add a hyperlink to an object or a layer within Illustrator CS6 for a later SVG export? I know about the possibility to manually edit the exported file and wrap elements with an <a> tag. But this complicates subsequent changes. It would be better to have solution that is integrated in Illustrator. In dropdown "Image input" select "Polygon"
Paste your link in input "URL"
Not the answer you're looking for? Browse other questions tagged adobe-illustrator website-design svg or ask your own question. How to disunite pie chart elements?